Sippin' Sweet Tea: Woo-hoo! We Made It to the Third Trimester! Woo-hoo! We Made It to the Third Trimester! They had to tweak one of my insulin dosages today, but other than that, the GB seems to be under control. The nurse-midwife I saw today said that may continue to happen as I get bigger...apparently at about 28 weeks (where we are today!) the placenta really kicks into gear and that can cause the GB numbers to go up. Gotta love those pregnancy hormones. I'll be going back in 2 weeks for a doctor's visit, then in 4 for another growth ultrasound. After that, I'll have to go in twice a week for fetal stress tests. Fun, fun, fun ... but we're in the home stretch now, so whatever it takes! 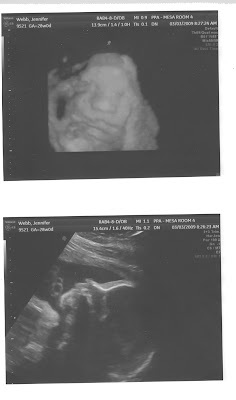 The second pic is a regular ultrasound profile, but the first is one of those funky 3D-ish ones. It was weird watching the tech "dial in" on Peanut's face. Crazy, the stuff they can do now. I think that's about it. My cold is about gone, though my voice isn't 100% yet - still kinda comes and goes. I think Hubby's getting sick now ... though hopefully, since he's sans pregnancy hormones, he'll kick this much faster than I have been able to. Copyright 2008-2017 - Jennifer Webb - All Rights Reserved. Powered by Blogger.